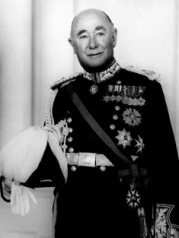 Today in Masonic History Arthur Espie Porritt is born in 1900. Arthur Espie Porritt was an New Zealand doctor, athlete and politician. Porritt was born on August 10th, 1900 in Wanganui, New Zealand. When he was 14 his mother passed away and shortly after his father sent to serve in World War I. In 1920, he started working on a medical degree, in 1923 he was awarded a Rhodes Scholarship. He studied medicine at Magdalen College, Oxford from 1924 to 1926. While in school Porritt became a gifted athlete. In 1924 he represented New Zealand in the Olympic games that were held in Paris, France. He won bronze in the 100 meter dash. The winner of the race, Harold Abrahams, and Porritt became friends and every year on July 7th at 7pm the two would dine together. This was the date and time of the race at the 1924 Olympics. The race between the two men was later immortalized in the movie Chariots of Fire, Porritt being a modest man, his name was changed in the film to Tom Watson. Porritt would go to compete in the 1928 Summer Olympics. He was one of only two people to be the New Zealand flag bearer twice. After retiring from competition at the Olympics, Porritt became the team manager for the 1936 Olympics in Berlin. He also became the New Zealand member of the International Olympic Committee from 1934 to 1967. He was the first President of International Olympic Committee Medical Commission. In 1940, Porritt was commissioned as an officer during World War II. He served through out the war and was part of the Normandy invasion on D-day. He left the military in 1956. He was the King's Surgeon from 1946 to 1952 and Serjeant Surgeon for Queen Elizabeth until 1967. In 1967 Porritt returned to New Zealand after being made Governor General of New Zealand. His appointment was a turning point in the history of New Zealand. All of his successors have been New Zealanders and all but one have been born in New Zealand, that individual moved to New Zealand at the age of two. His term ended in 1972, after which he returned to England. Porritt passed away on January 1st, 1994 in London, England. Porritt was the Grand Master of the Grand Lodge of New Zealand during his term as Governor General.